Martha is an actor, singer, deviser and theatre maker who hails from Co. Down but is now based in Dublin. She played Arte O’Neil in The Shaughran at Smock Alley, directed by Clare Maguire and recently revived Half Light at The Ark. 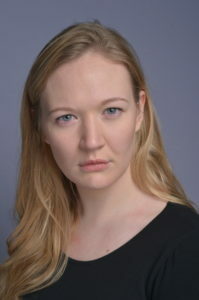 Her previous acting and devising credits include The David Fragments (Greenwood Theatre, Kings College London and the Samuel Beckett Theatre) Half-Light (Smock Alley, First Fortnight Festival; New Theatre, Tiger Dublin Fringe Festival 2016 award winner and Samuel Beckett Theatre). Acting credits include 16 and Rising (Galway Town Hall Theatre), Mercury (The New Theatre), Salome, At Swim- Two Boys, Rosencratz and Guildenstern Are Dead, The World We Live In ( all Samuel Beckett Theatre), Mercury Fur ( Players Theatre and ISDA Festival 2016) and Out of the Box: A New Musical (Camden Fringe Festival). Martha has also performed in the Grand Opera House Belfast with St Agnes Coral Society in the Sound of Music and in Waterford IT and in the Samuel Beckett Theatre as a vocalist for the Trinity College Masters in Composition Showcase. Martha holds a BA in Drama and Theatre Studies from Trinity College Dublin, and is a part of the touring production of ‘Half-Light’ in 2018.